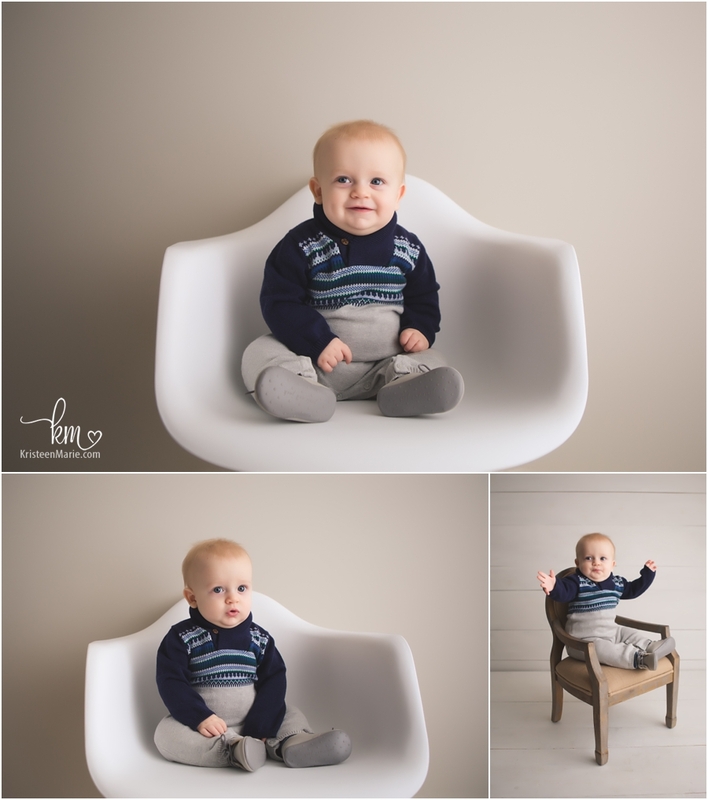 This little cutie is 9 months old and he was such a happy baby in the studio! 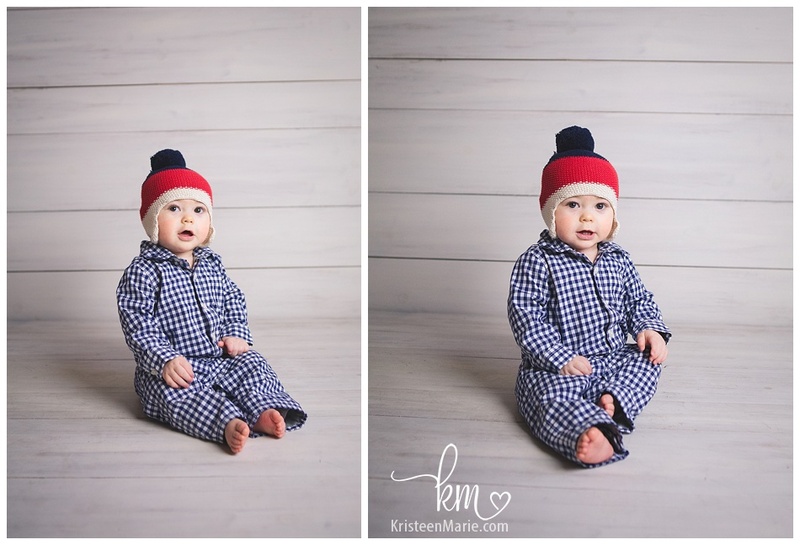 He came in for a mini milestone session so we were able to get some naked baby photos as well as an adorable little outfit. So great to meet you little man! 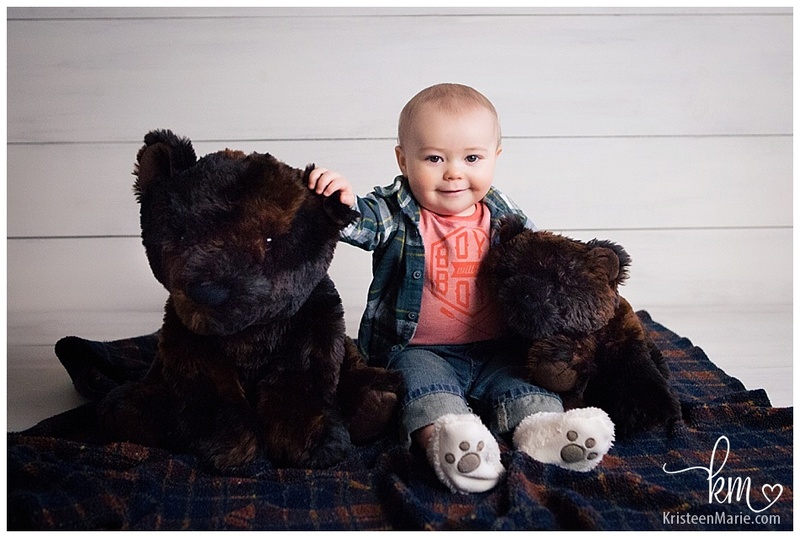 Just a few more months and you’ll be celebrating your first birthday! 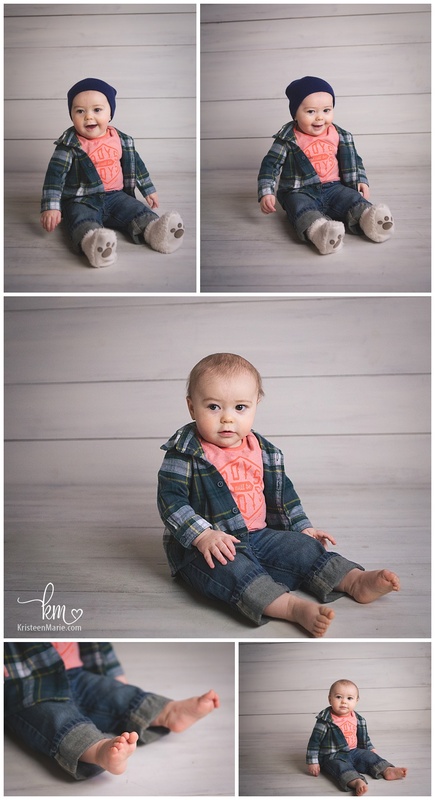 If you are looking for an Indianapolis photographer to have milestone photos of your baby to capture him or her growing up, but sure to contact me as I offer a few options for milestone photography! 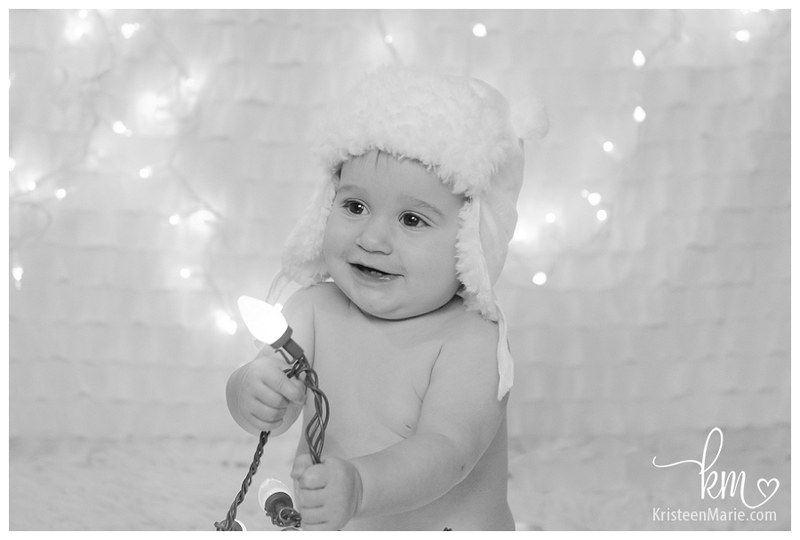 Having little Luka in the studio is always a good time. 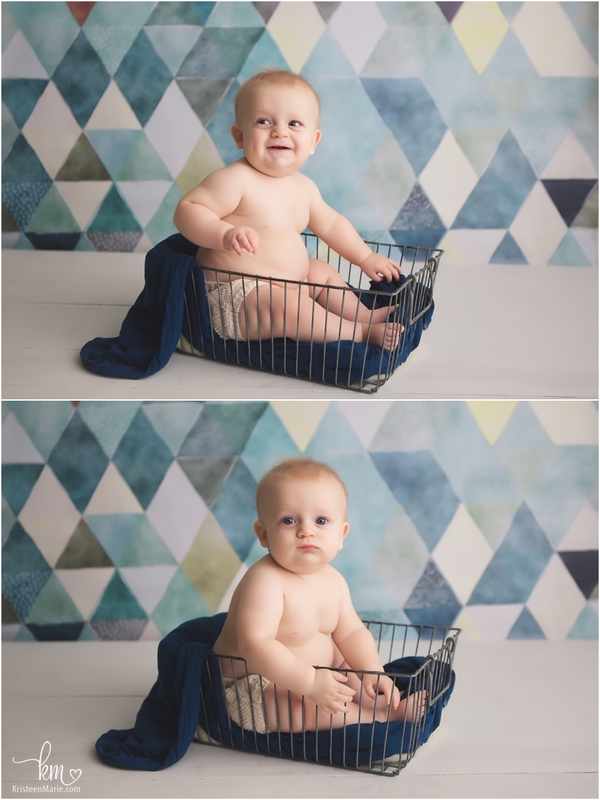 He is such a happy baby. 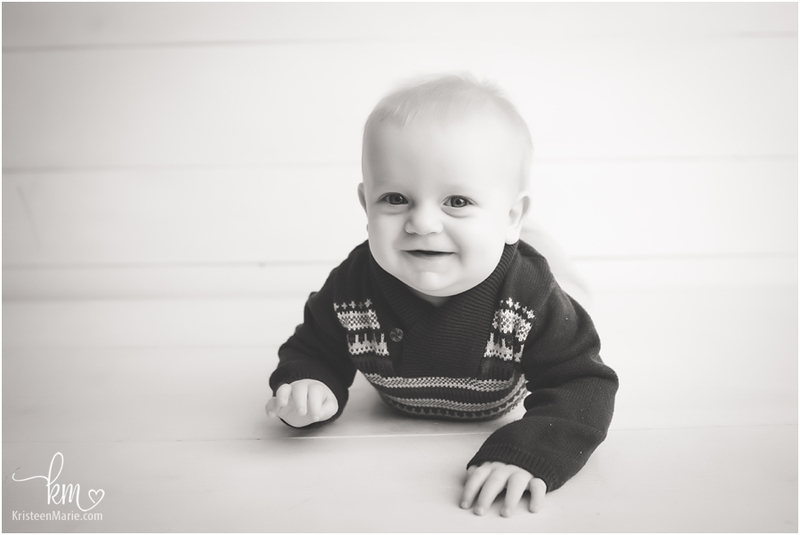 He is 9 months old this time and he is a moving all over now. I love watching these little ones grow! Come back and see me soon Luka! 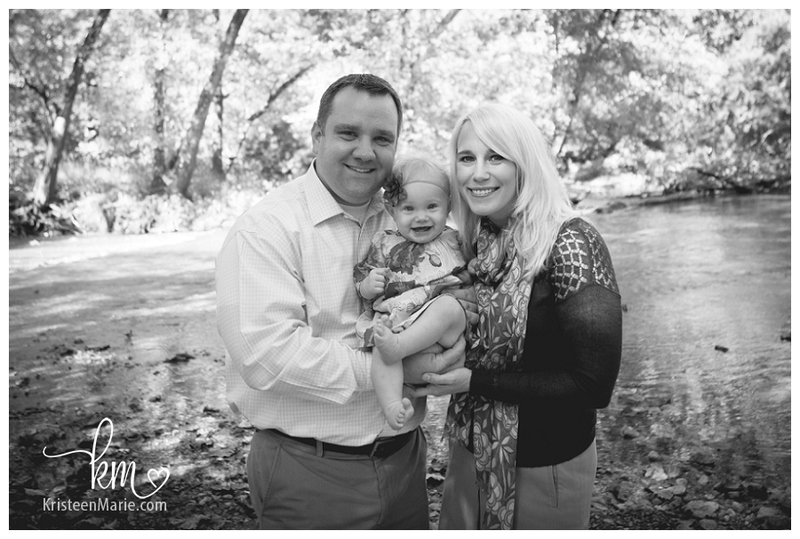 If you are looking for an Indianapolis child photographer be sure to reach out and let me know. 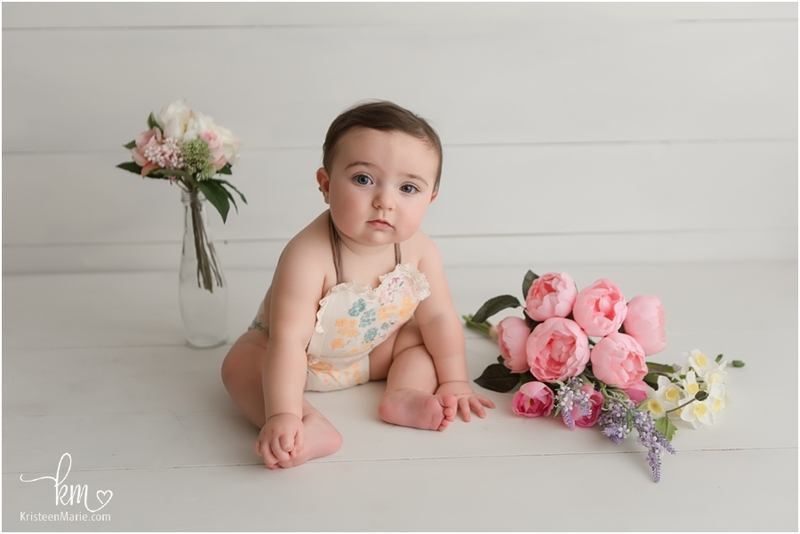 I would love to have your child in my studio. 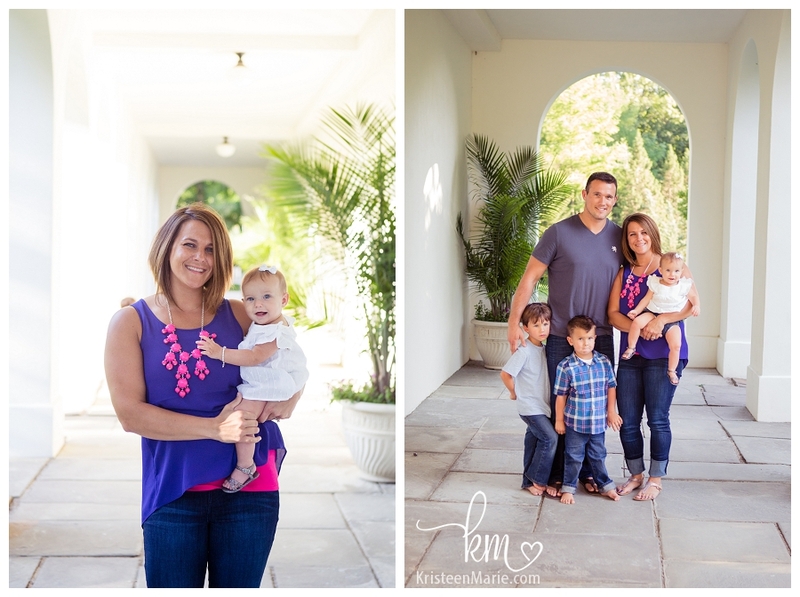 I’ve been photographing this family every three months since little Reese was in her mom’s belly. 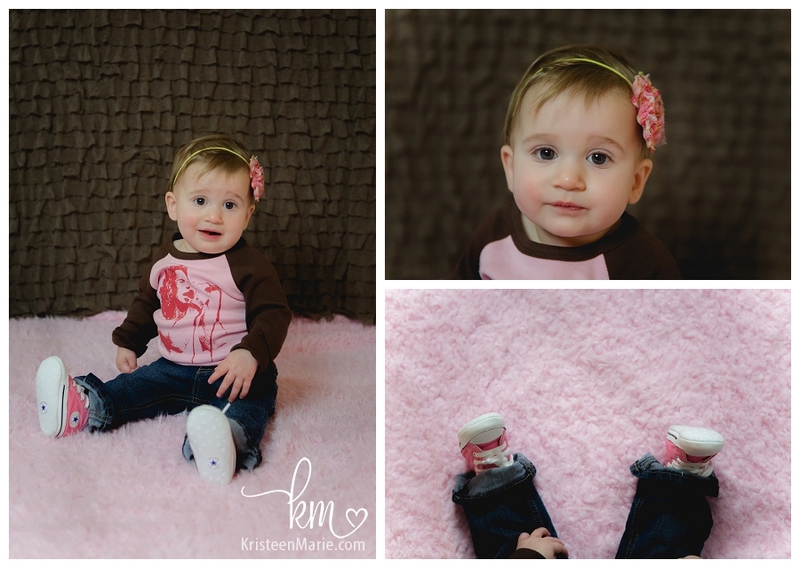 She is growing up so fast and she is already 9 months old! 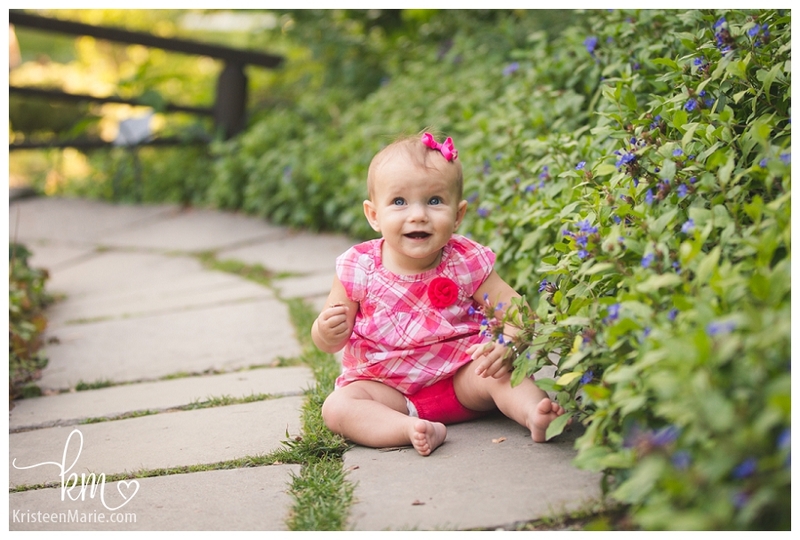 We did Reese’s 9 month session outside at sunset at the Indianapolis Museum of Art (IMA). 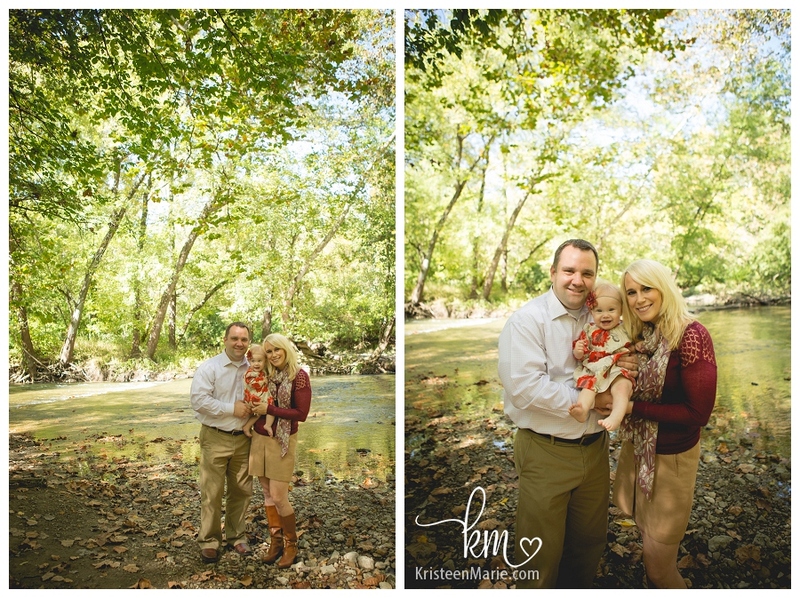 This is such a fun family! 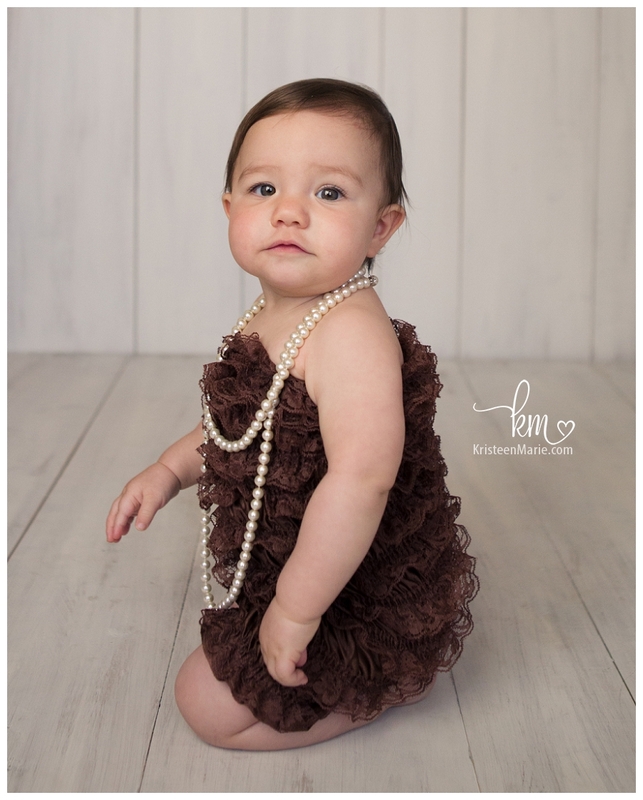 I can’t wait for her 1 year cake smash session. 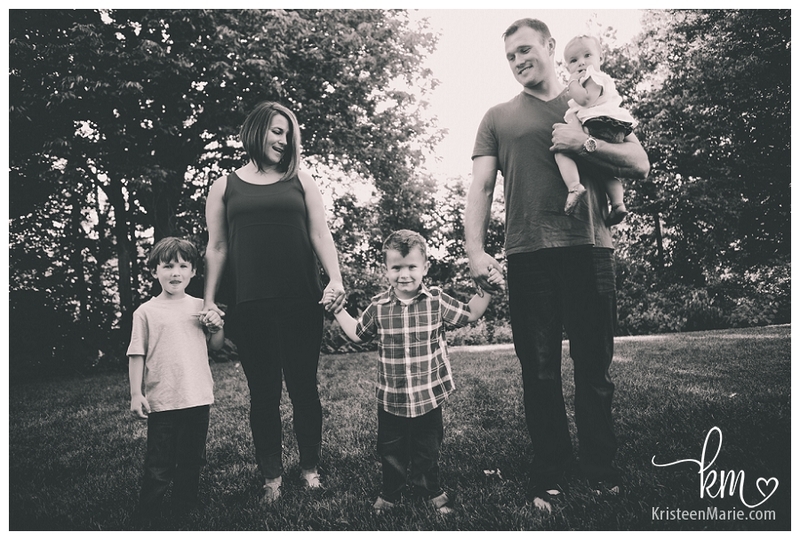 If you are looking for an Indianapolis family photographer be sure to reach out and let me know. I love meeting new clients. 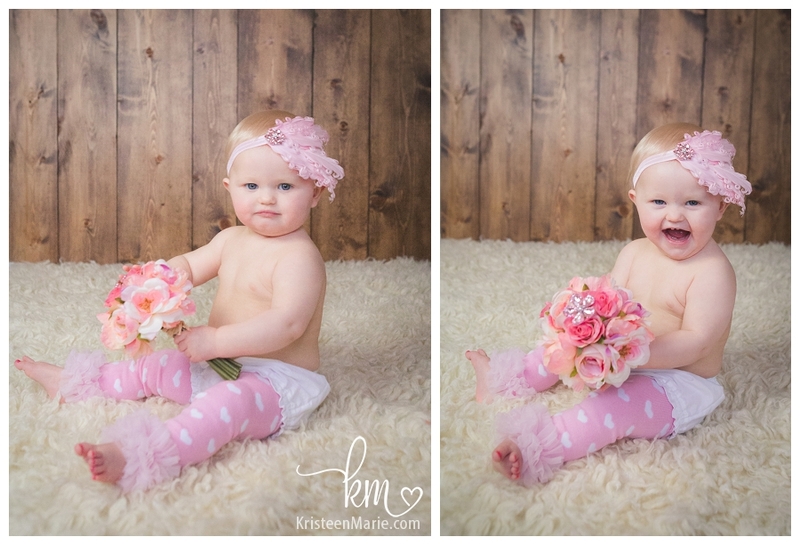 Are you ready for the world’s sweetest smile?! 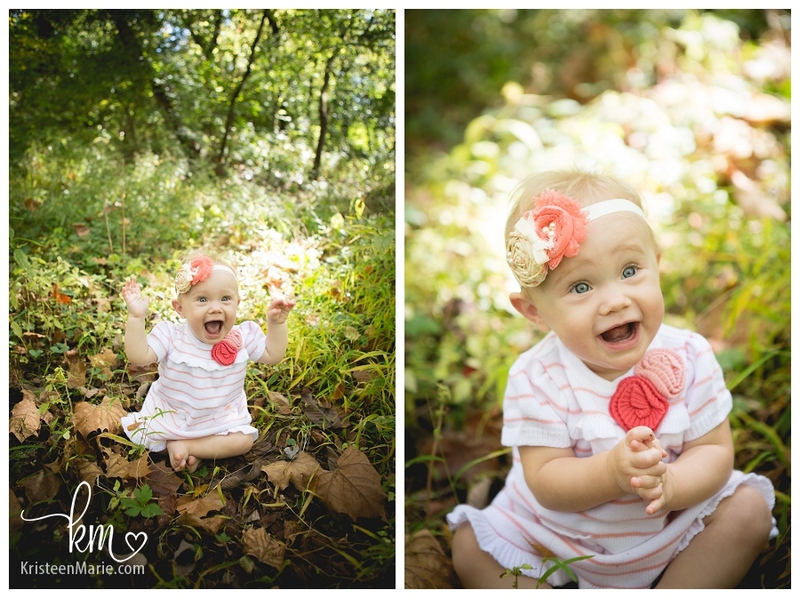 If this little 9 month old girl doesn’t make you smile then I don’t know what will. I hope you are smiling as much as this little girl was. 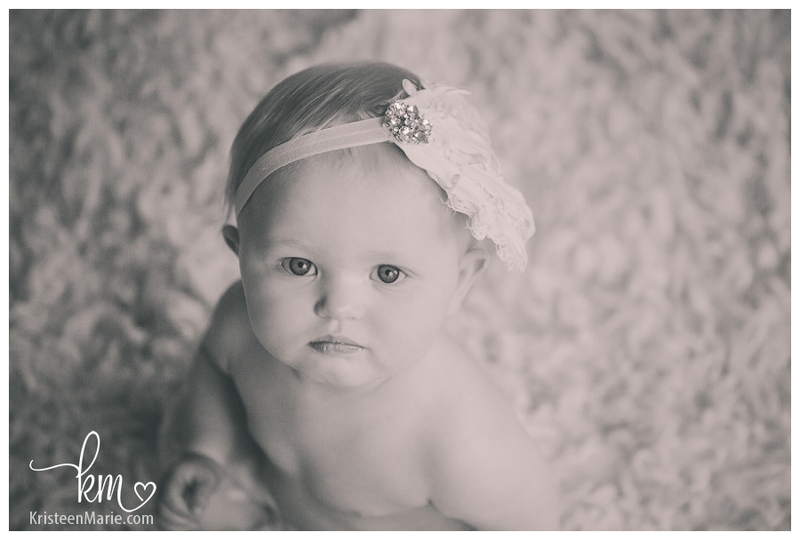 If you are interested in Indianapolis child photography be sure to let me know. 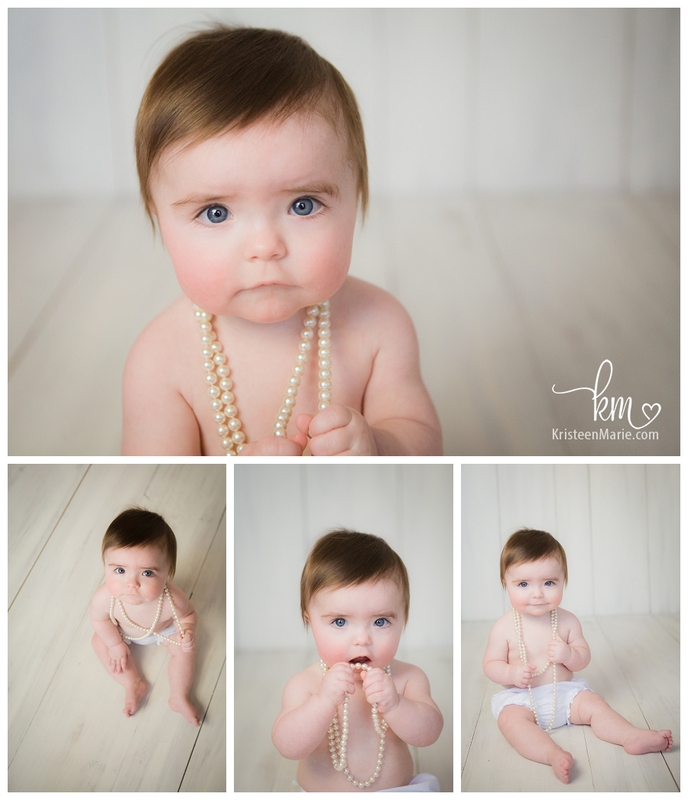 I would love to have you and your little one in the studio soon. 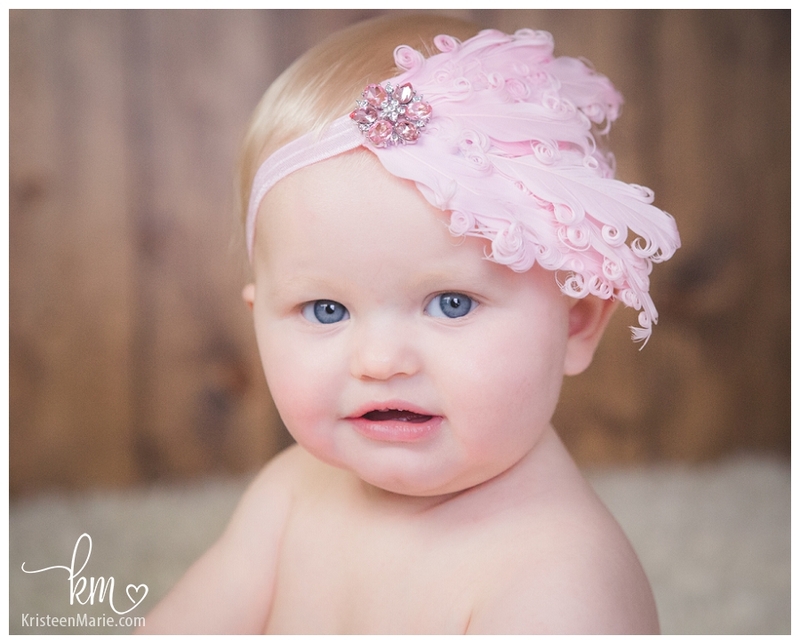 Little Charlee is 9 month old. 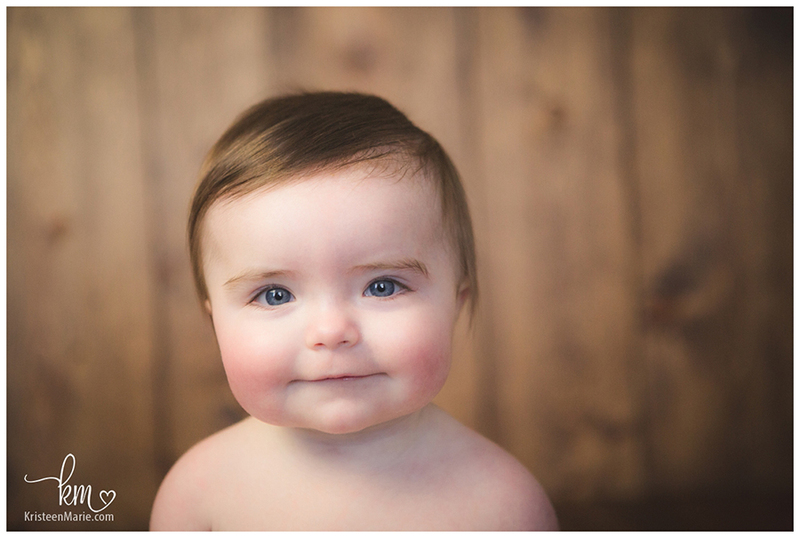 She had lots of serious faces for me. 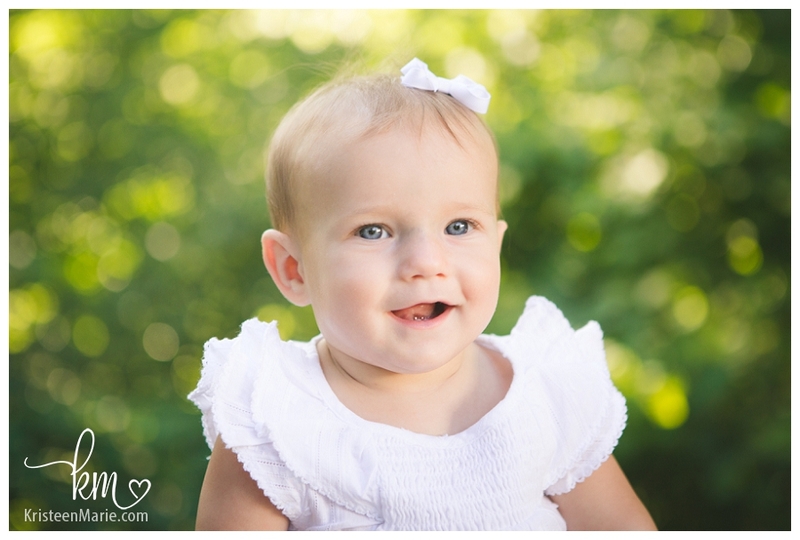 She made me work for those smiles, but it was so worth it! She is such a sweetheart. 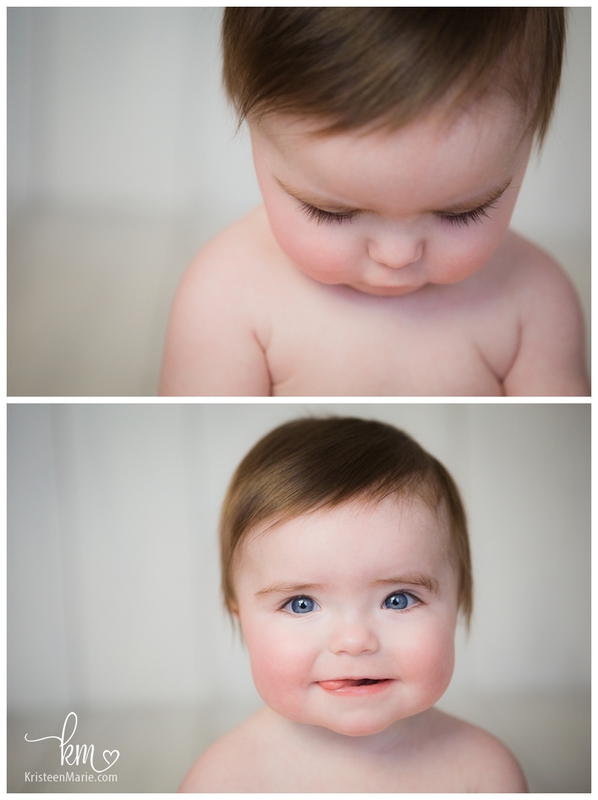 I love her fair skin and bright blue eyes. 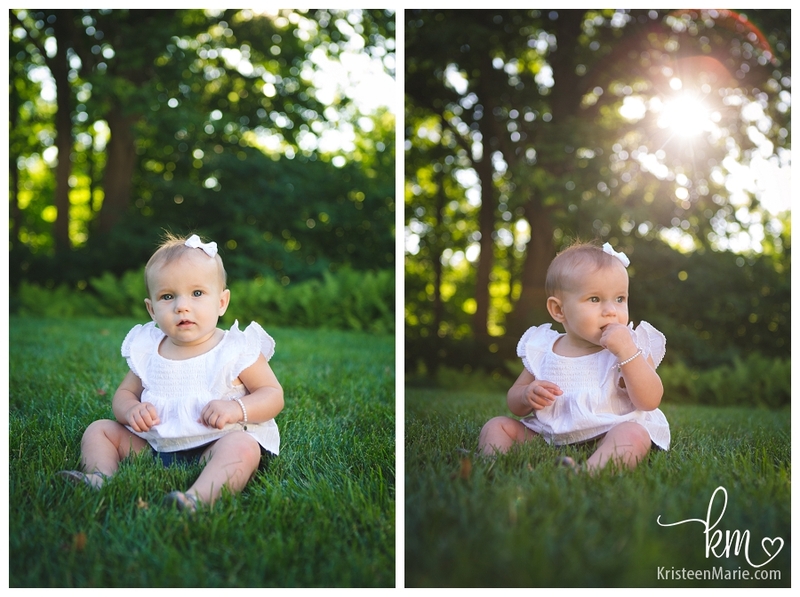 I can’t wait for this little lady’s 1st birthday session! 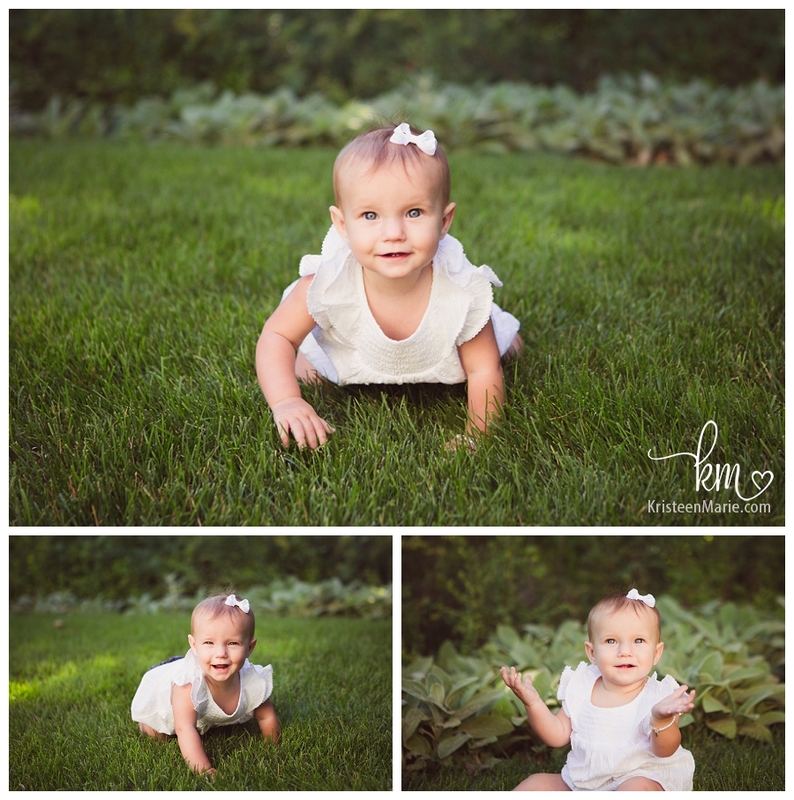 If you are looking for a Carmel child photographer be sure to reach out and let me know. 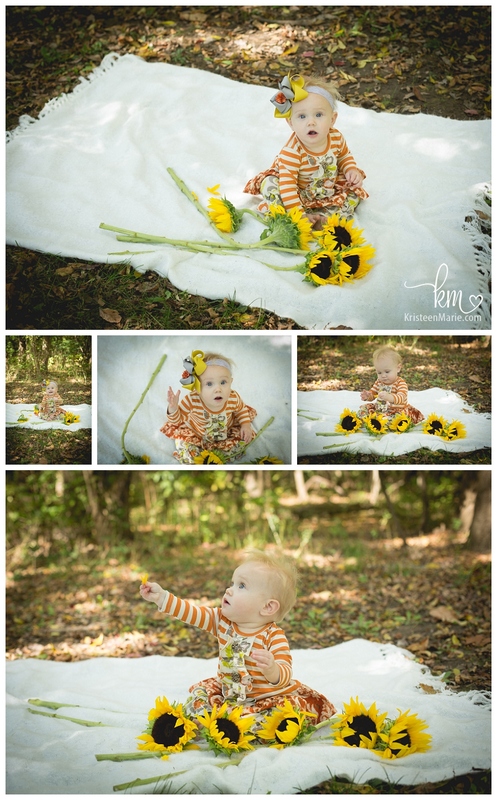 I would love to get you and your child into the studio! 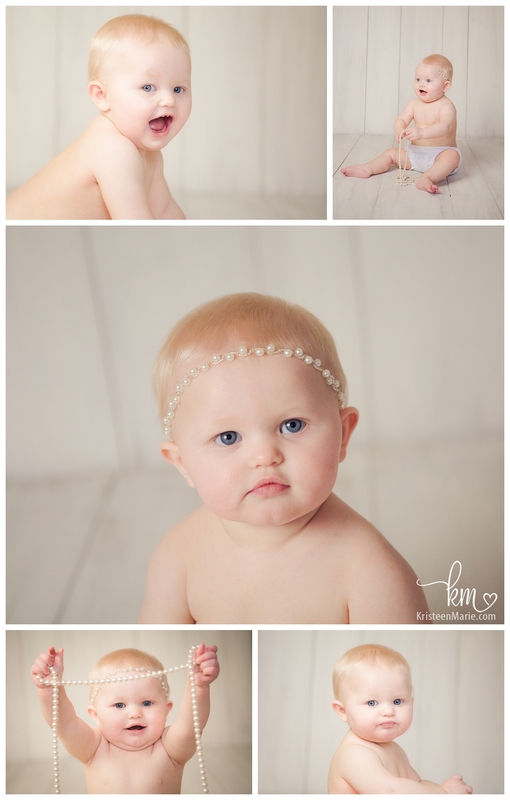 I’ve been photographing this little lady since her birth and I can’t get over how cute little Remy is! 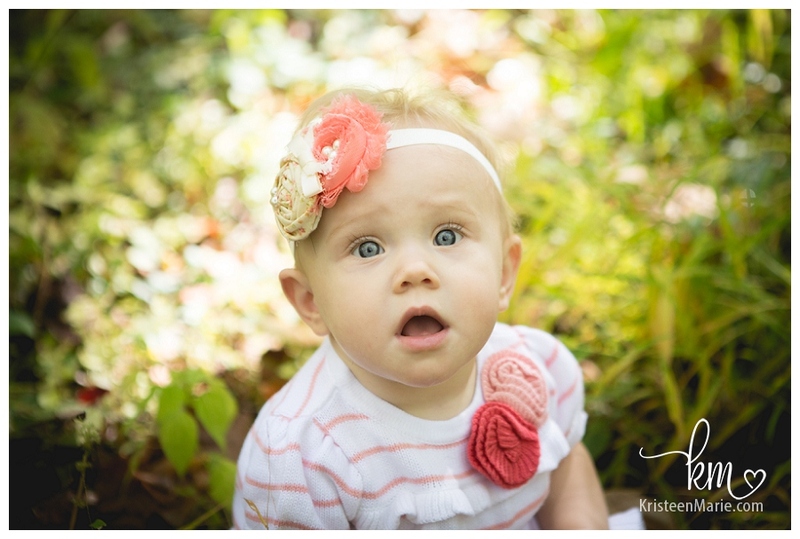 Her beautiful blue eyes are just too much. What a sweetheart. 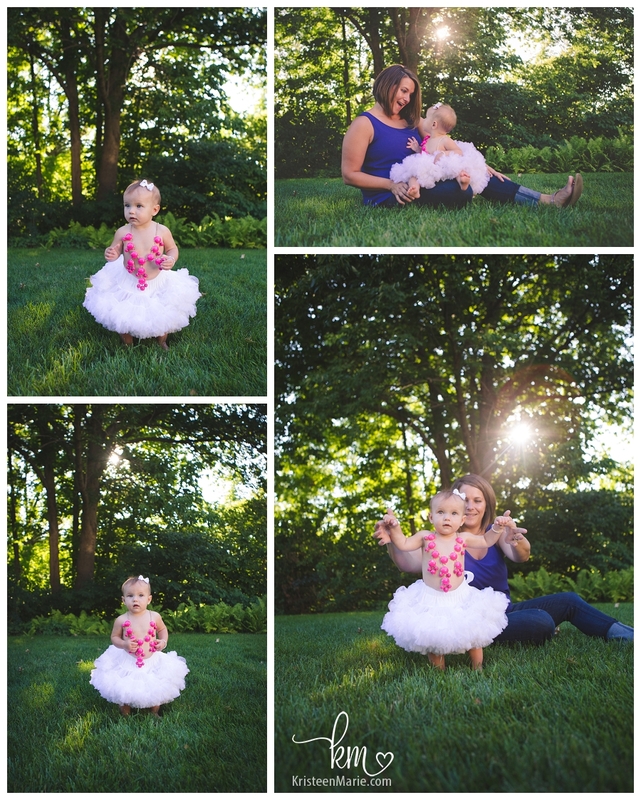 I can’t wait for her first birthday cake smash session! 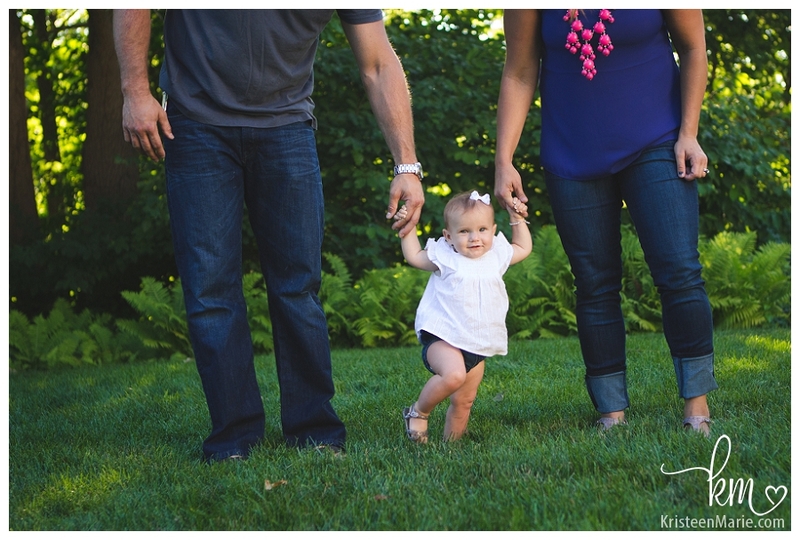 If you are looking for an Indianapolis child photographer be sure to let me know! I would love to have you in my studio. 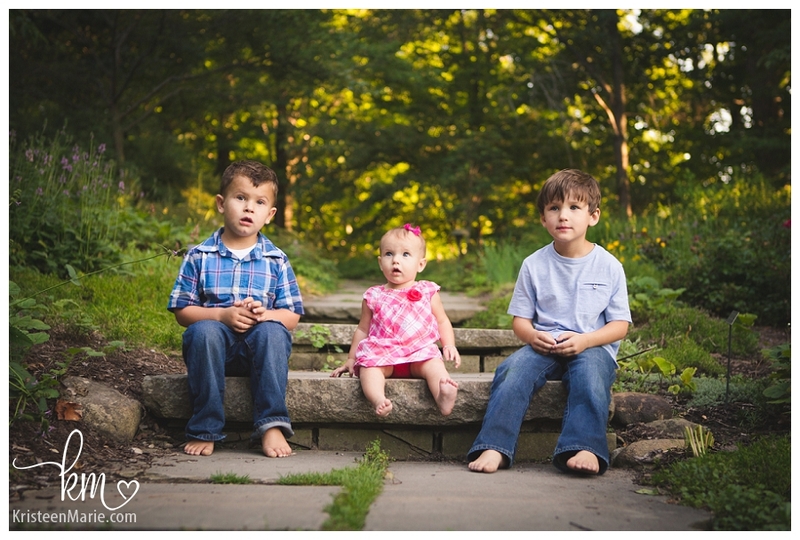 Kids grow so fast! 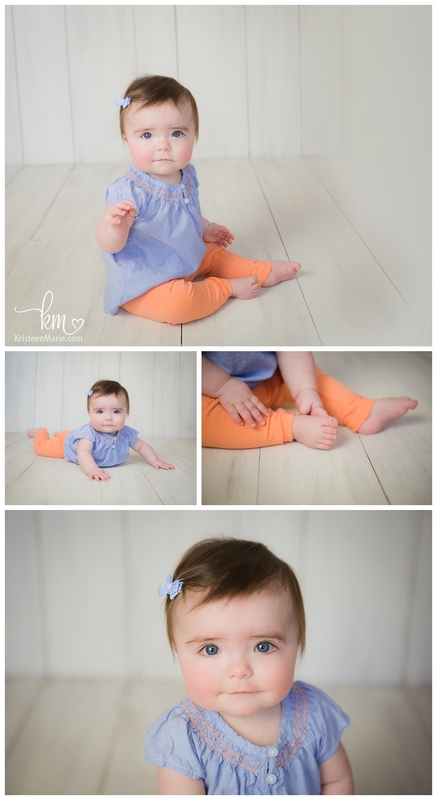 I can’t believe Lydia is already 9 months old. 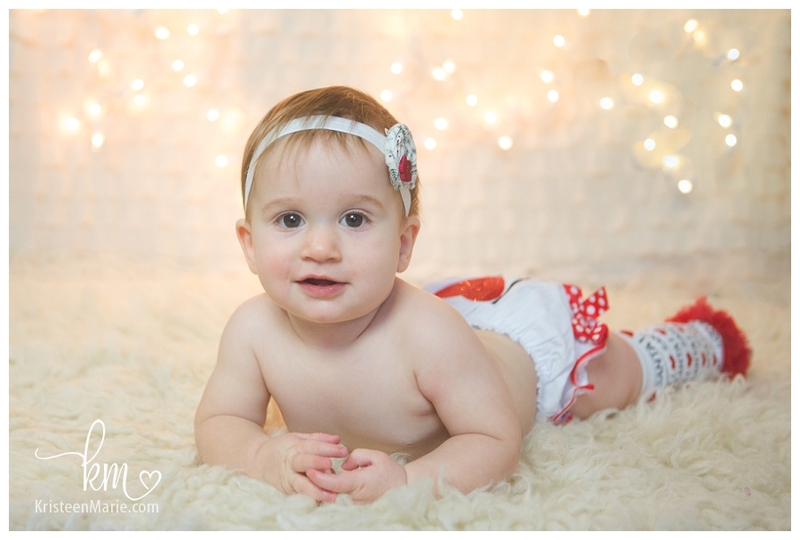 For her session we did some Christmas card pictures. 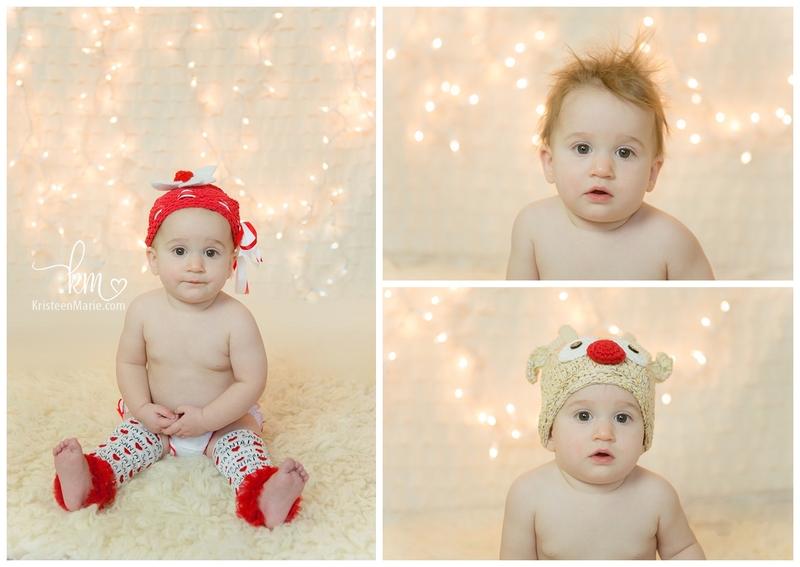 Red and green outfits and Christmas lights on a little kid couldn’t be any cuter! 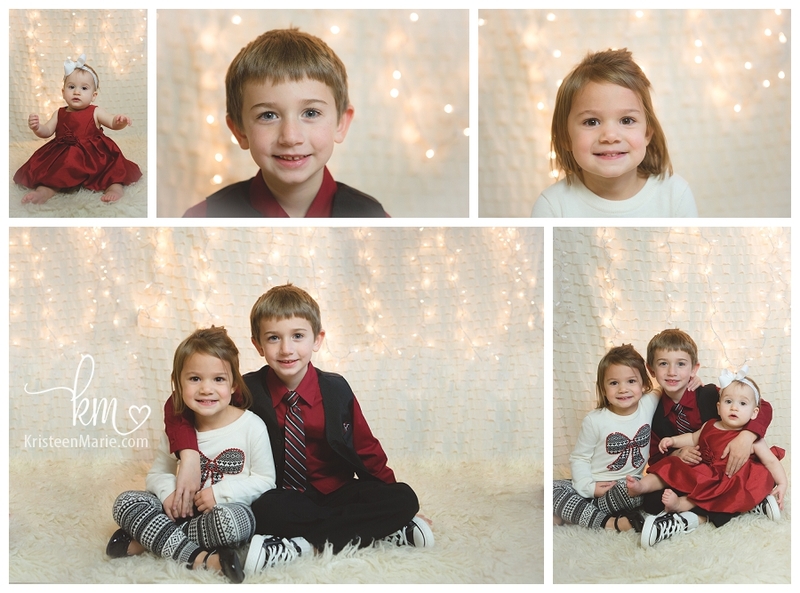 Don’t worry, we got some non-Christmas pictures too. Such a sweetheart! 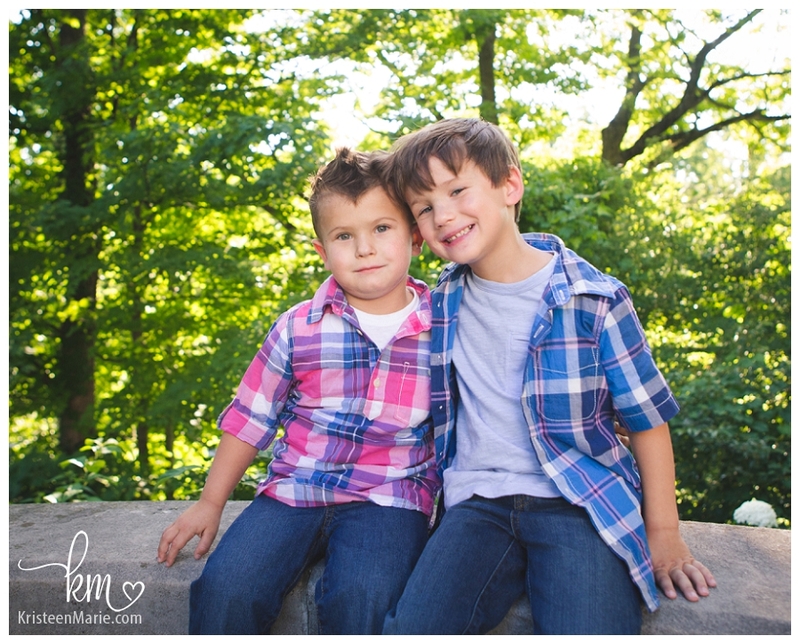 Are you looking for a child photographer in Indianapolis? 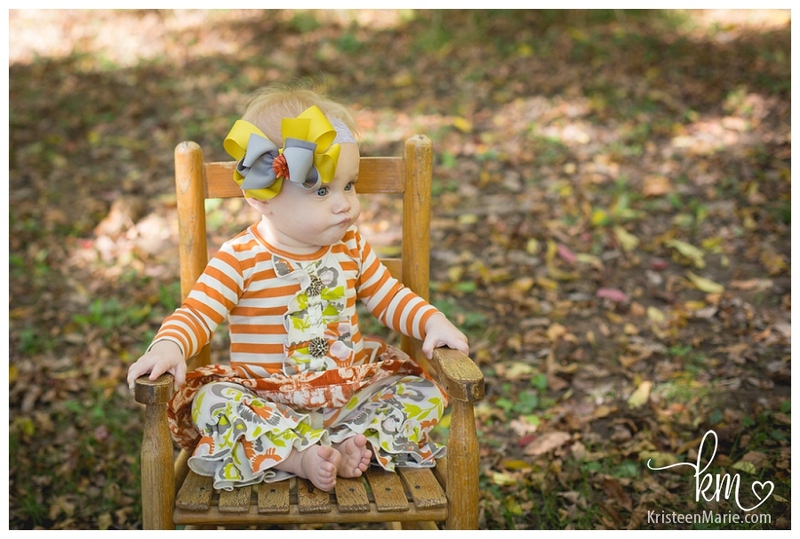 If so be sure to reach out to KristeenMarie Photography to check on pricing and availability. 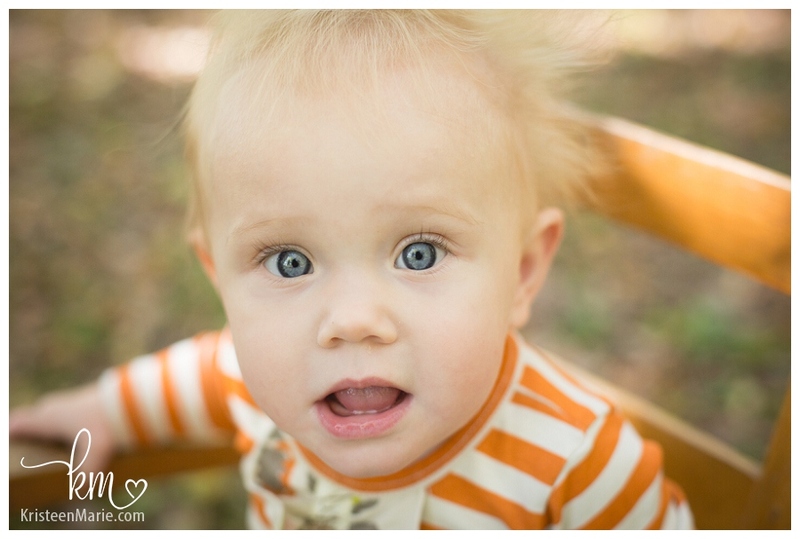 I know I’m not suppose to have favorites, but I do and Payton happens to be one of them! 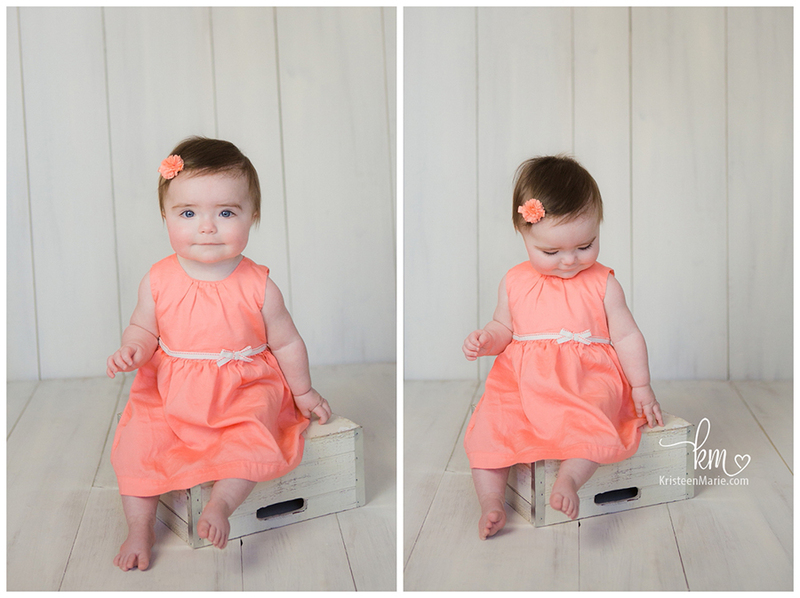 While she maybe wasn’t my easiest newborn I’ve ever photographed she is a pretty easy 9 month old. 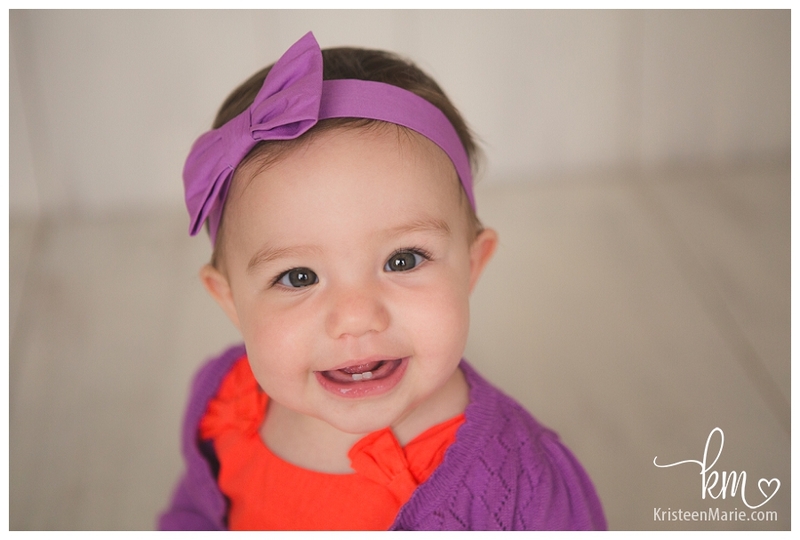 She has some big glowing smiles that I just can’t get enough of. 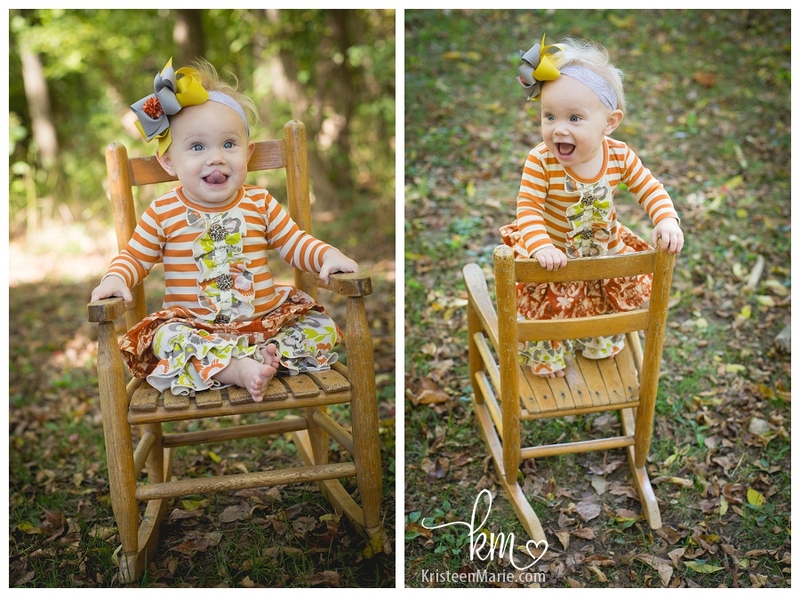 I can’t wait for Payton to turn one. 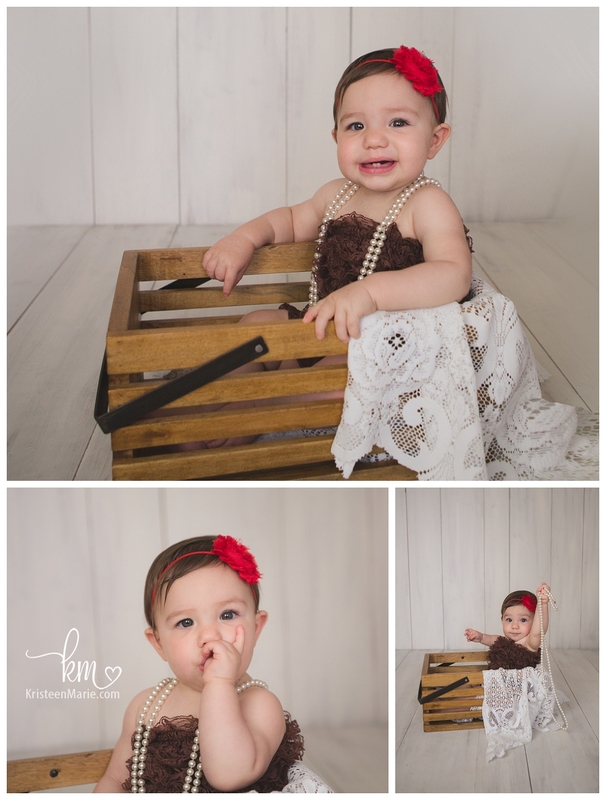 Her cake smash session is going to be a blast! 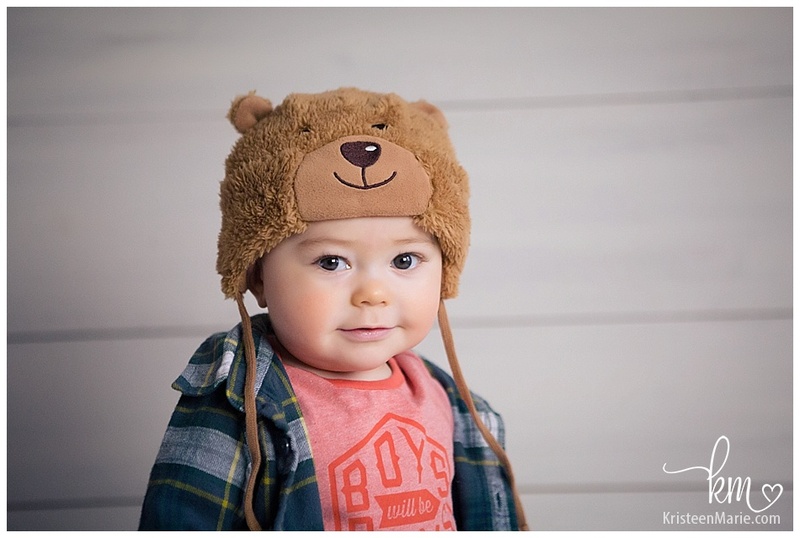 If you are looking for an Indianapolis child photographer be sure to reach out to me to check on pricing and availability.